As a branded proposal, SmartTrack is just over two years old, but writing a “brief history” of the transit proposal first launched in May 2014 is daunting. What is SmartTrack? Where does it come from? Where is it going (literally and figuratively)? These are some of the great questions of our age. There’s great analysis of them here and all around by Steve Munro and others. We’re going to try to sum up the history of what is, for better and worse, Mayor John Tory’s signature transit policy. 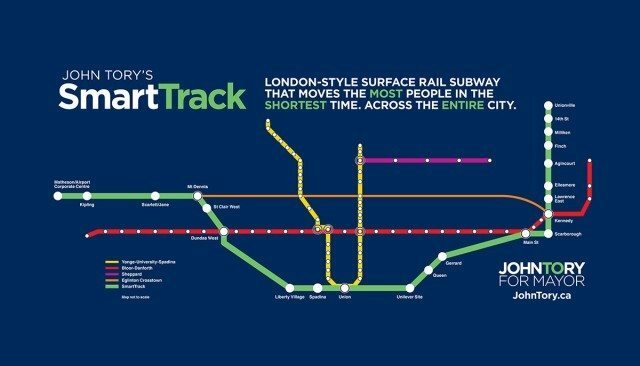 Working backwards to find SmartTrack’s Ur-moment—the point at which it crawled out of the primordial ooze onto the land of transit-planning reality—is tricky, but it definitely doesn’t start with John Tory and the 2014 mayoral campaign. Metrolinx began studying how to turn this idea into reality a few years ago and has had a real plan [PDF] since 2014. The short-term upshot was to first electrify the Lakeshore line. New stations, twinning of rail lines, expanded parking lots (of course); it’s all happening over the next 10 years. Alexander Graham Bell gets all the good press for inventing the telephone, but history buffs know Antonio Meucci preceded him and got the shaft. Just as Bell has Meucci, Tory and his team have Markham councillor Jim Jones. It’s interesting to note Metrolinx’s position at the time, just four years ago: Jones’s idea was unfunded and not technically possible and, most significantly, RER wasn’t going to offer local service within Toronto. It was the dog days of the 2014 mayoral campaign. Everywhere incumbent Rob Ford went, he took “subways, subways, subways” with him. If Toronto ever had the notion that transit planners at the city and/or province should plan transit, it was out the window. All you needed was a napkin and a few differently coloured crayons. Running for mayor in 2014 required you to provide a superficially feasible, not-necessarily fundable transit plan. The only catch was that it was Bring Your Own Napkin. So, John Tory unveiled SmartTrack [PDF] in May 2014. 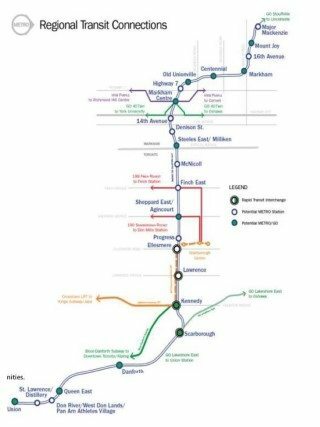 The proposal: 53 kilometres of “surface subway” rail service, serving 22 GO stations, many within the city on existing GO lines, all for the low(ish) cost of $8 billion, and built way faster than the DRL too. (The money would come from Tax Increment Financing, an interesting if unusual and mostly untried financing mechanism in Ontario. Getting into why that wouldn’t work is for another time.) The east leg of SmartTrack should be instantly familiar from the i-METRO-E map, running along the Stouffville line. Yup, it even goes up into Markham. The big difference was finishing the “U” with a branch serving the west half of the city via the Kitchener line. On that contextless blue background, it looked like a great plan. There was, however, a catch. Connecting existing rail lines out to the Pearson airport corporate centre required a new spur that was, how shall we say, geographically challenging. Tory’s schematic map relied on research from an outdated version of Google Maps and didn’t account for the fact the right-of-way he wanted to use no longer existed. The western spur was also very expensive; some estimates later put it at up to $5 billion. It quickly became clear (at least to transit nerds who followed this stuff) that the more you looked at the specifics, Tory’s plan wasn’t workable and, more to the point, definitely piggybacked onto Metrolinx’s GO plans, about which most of the public still knew nothing. 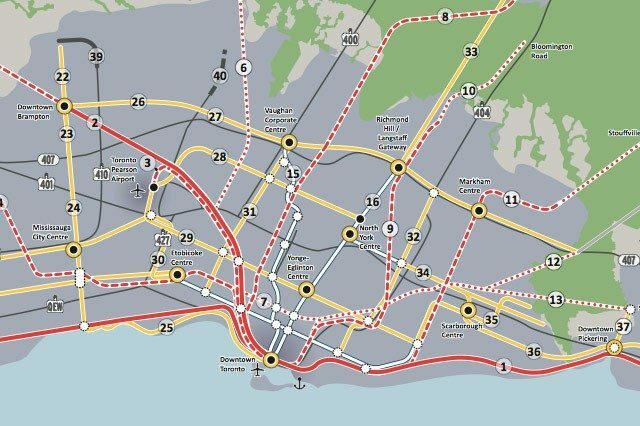 It was basically a TTC plan running on GO’s tracks, on which GO already planned to run a virtually identical service. How that would all come out in the wash remained to be seen. Photo by Alex Guibord from the Torontoist Flickr Pool. Once Tory was elected, the plan was hammered into something real and workable. The more that happened, the more it became clear few elements that distinguished SmartTrack from RER would survive the process. 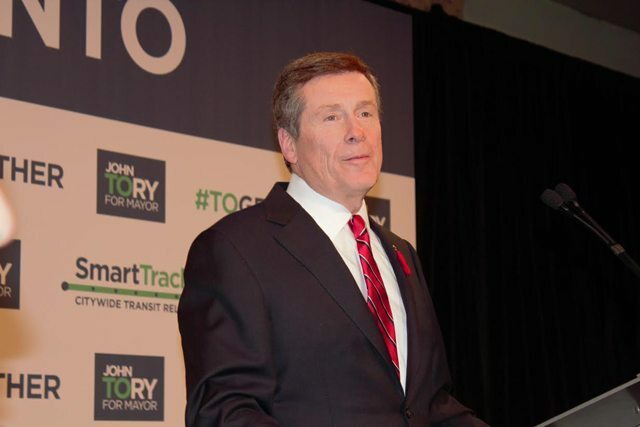 In December 2014, as one of his first mayoral acts, Tory and Council asked TTC and staff to kick in some money, sit down, and actually study SmartTrack. Staff came back with a report in February 2015, laying out some of the basic parameters, including that the service provide all-day, two-way service on electrified trains and, on the new side, properly integrate fares between GO and TTC, new stations and service frequency exceeding the 15-minute levels proposed by GO. Going back to Tory’s initial promise, it is these last three points (fares, stations, and frequency) that effectively define SmartTrack. Staff were also tasked with figuring out what the heck to do with the Eglinton spur. But before they could, Metrolinx saved everyone the trouble and took the spur out behind the proverbial woodshed in January. This didn’t upset Mayor Tory, who basically said it made sense not to build the part of his plan that didn’t make sense. It’s also worth noting that at this point there were many balls in the air, with planning for the DRL and Scarborough subway moving forward. Word started getting out that the favoured routes for the Scarborough lines might not necessarily be the most sensible ones. That’s because the closer the Scarborough subway is to SmartTrack, the more they cannibalize each other’s ridership, and each become less viable than they already are. The Scarborough subway had another unintended side effect. Like SmartTrack, the further planning advanced, the more it became clear that the foundation upon which it was built was about as solid as a piece of driftwood buried in chocolate pudding. Needing to save face on Scarborough and SmartTrack while looking for a semblance of actual planning logic, Jennifer Keesmaat’s planning department came up with a compromise: the subway would be reduced to a single station (so Scarborough could still proudly yell, “We have a subway!”) and the remaining funds would be earmarked for an extension of the already underway Crosstown LRT. The spur wasn’t needed anymore anyway, and everyone was happy—for a bit. Source: Media Briefing from the Scarborough subway compromise, page 27 [PDF]. In Feburary, Metrolinx humoured the city by discussing how to integrate RER and SmartTrack, in much the same way you might consider how to integrate a new white t-shirt into your wardrobe, which already includes several white t-shirts. Though they looked at multiple options [PDF], it boiled down to adding a handful of new stations and, whatever anyone was going to say publicly, conceding that SmartTrack was an integrated service, not a parallel one. The city’s work culminated in a report approved at Council’s March 31–April 1 meeting. 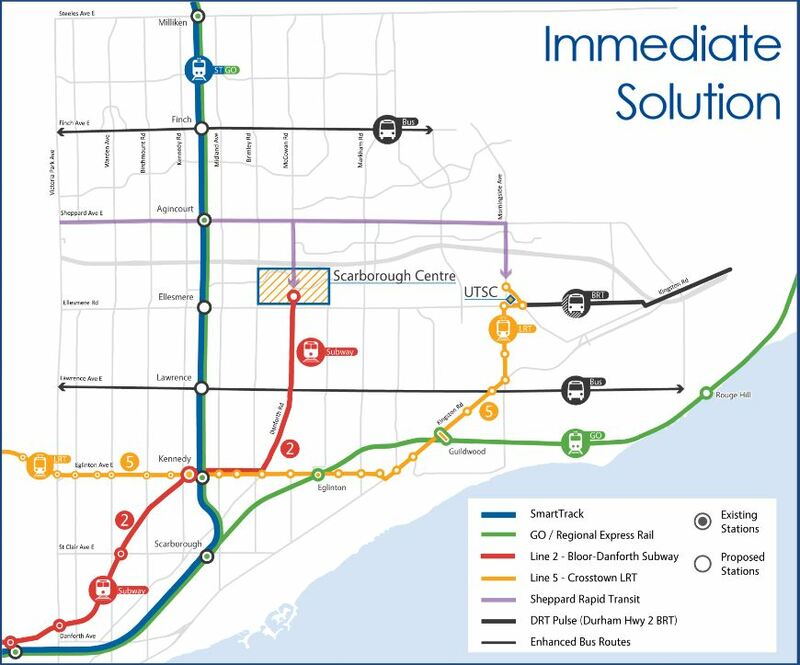 It was a biggie, outlining the city’s preferred transit future: it officially put the western spur to rest, established the preferred corridor for the Scarborough subway, and provided approval for the City and Province to move forward with the nuts and bolts of planning SmartTrack as it is. Ah, the summer solstice! It’s the longest day of the year, but this year it got a little warmer with news the Minister of Transportation had something SmartTracky to say. Does SmartTrack, as it exists today, now have 22 stations? No. Does it have subway-level frequencies? Not so much, though stations within Toronto may, at least sometimes, see service better than RER’s typical 15 minutes. Will it cost you the same as riding TTC? To be decided, but probably not. 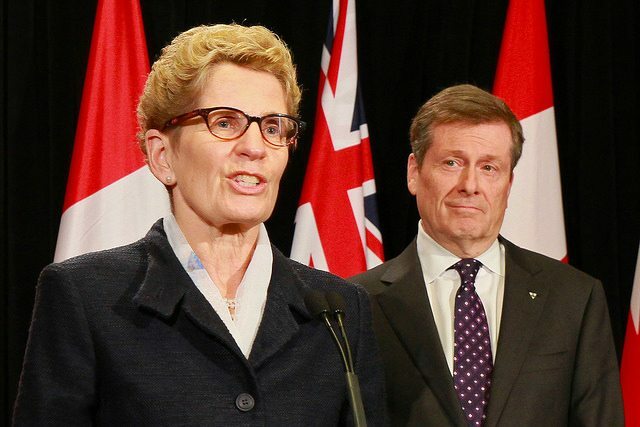 Is John Tory very happy about how SmartTrack, the signature policy that got him elected, has come out? Damn straight. Oh, and did we forget to mention money? Yeah, by the end of November Toronto will have to commit to its share of the funding for the extended Crosstown line and SmartTrack, estimated to be around $1 billion. Luckily, our transit capital estimates never get out of hand, right? SmartTrack doesn’t really exist, but also it sort of does. Whether all this was a good thing and whether it will benefit riders remains somewhat abstract. As of today, SmartTrack is smaller than it was supposed to be, but RER has still grown from its initial concept. Tory (and/or Jim Jones) deserve some credit for that evolution. “I promise to do everything I can to work with the province make sure GO’s new RER plans include new stops and fair fares for Toronto riders,” wouldn’t have had much oomph as a central campaign plank, but it probably would have been more accurate, given where we’re getting.